Based in Brisbane, QER builds and operates safe, economically viable and sustainable shale-to-liquids energy plants. Their vision is to help secure Australia’s energy future. 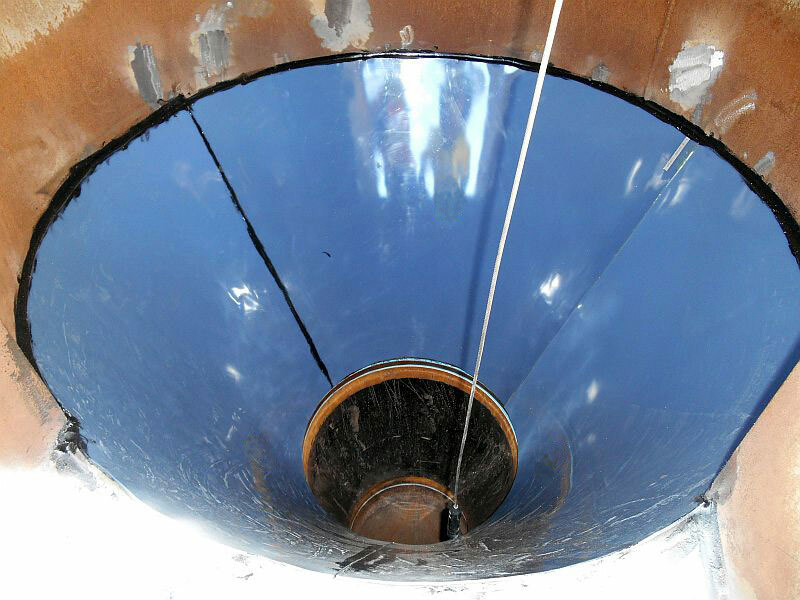 Queensland Energy Resources (QER) needed to install a mass flow cone into an internal feed bin in the retort. The best half angle for the bulk solid to allow mass flow was 70° for mild steel. QER also knew that at 60° the flow was within the transition area (mass flow/ funnel flow). Due to constraints within the retort, the maximum half angle that could be achieved was 64.3°. The K-Slip Low Friction Liner is a low co-efficient of friction thin polyethylene lining material, with a synthetic rubber backing (SBR). The thin flexibility of Kinder Australia’s K-Slip suited QER’s needs because it allows almost any complicated shape to be lined including bins, hoppers and chutes, providing a reliable and effective uniform surface and therefore improve the controlled rate of flow. The application to a metal surface is by normal cold rubber bonding. The addition of the K-Slip Low Friction Liners reduced the half angle requirement for mass flow below 64° and hence the hopper was capable of achieving targets to meet effective mass flow levels. To fit the pieces of K-Slip in through the door, it was cut into 3 sections. The steel faces were cleaned and the K-Slip was glued into position with industrial adhesive (similar to contact cement). Having K-Slip on a rubber backing makes it simple to glue into position. QER’s Lead Mechanical Engineer had used K-Slip in the past on similar problems and had discovered then that it improved flow effectively but that it was also straightforward to apply.